The “Job Application Assistant” Program will be a faithful assistant for you in the process of job search. It allows you efficiently maintaining records of your job applications and CVs sent by you to employers, keeping a list of employers and also enabling you to quickly and easily create your profile for mailing to potential employers. Work with the program will not be difficult for you. To begin, you just need to add a new job application, while indicating the information on the vacancy, employer and contact person. 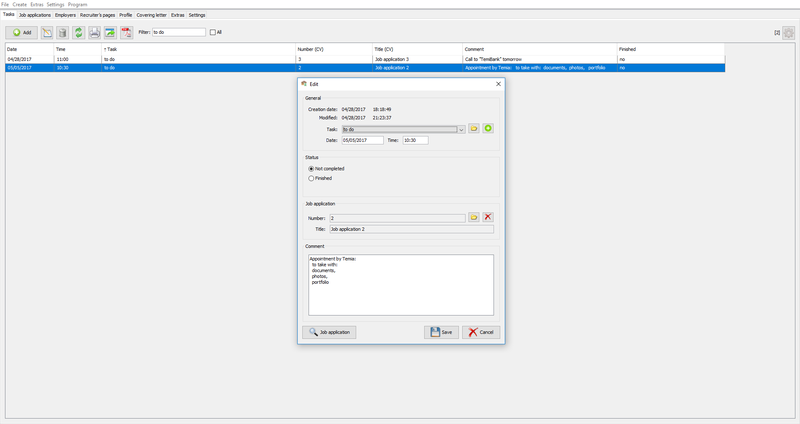 When adding a job application, the specified employer will automatically be added to the list of employers in the program. Later, when sending a job application to another vacancy of the same employer, you can simply select it from the list. You can also add any information on the job application, for example, status, or indicate the priority of the vacancy according to a five-point scale. 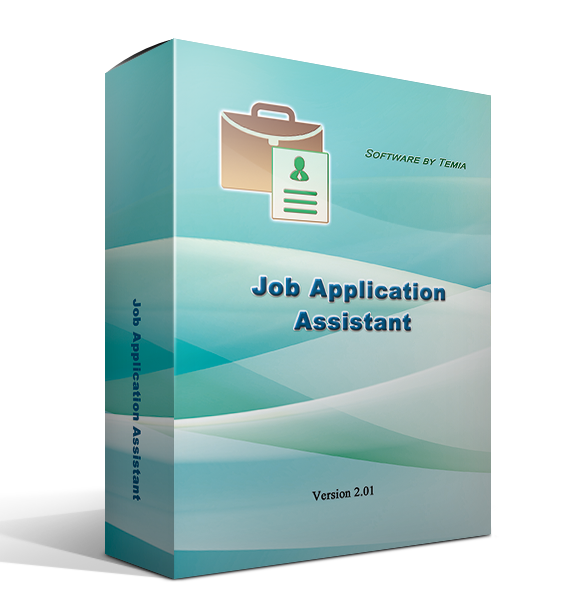 The program allows you searching for jobs on all the information entered. You can also add documents in any formats. Each job application has a status associated with a colour. You can create your own statuses and assign them your own colour. The status marked as initial will be used, when adding a new resume. When you change the status, a mark will be automatically added, so you can always track the dates for the status changes. 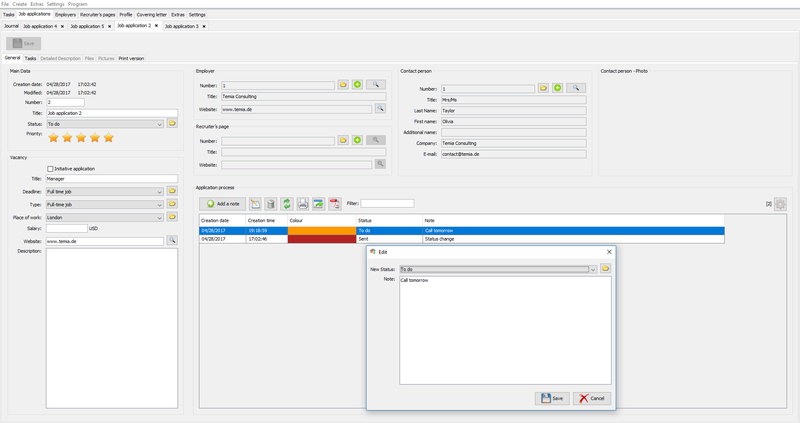 You can add tasks in the program, which are reminders of upcoming affairs. Each task can be linked to a job application. Completed tasks can be labelled as “completed”. You can create your profile and a cover letter for an employer in the program. The program will generate your profile automatically according to the filled in fields about the place of study, work, additional knowledge, skills, etc. 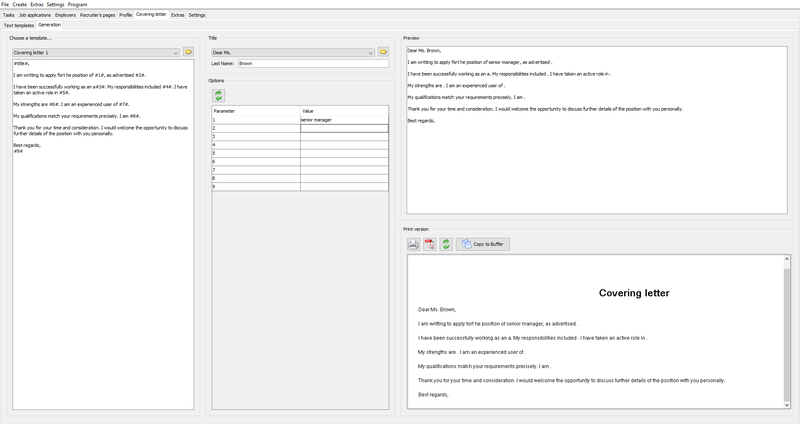 Moreover, you can add templates of cover letters in the program. 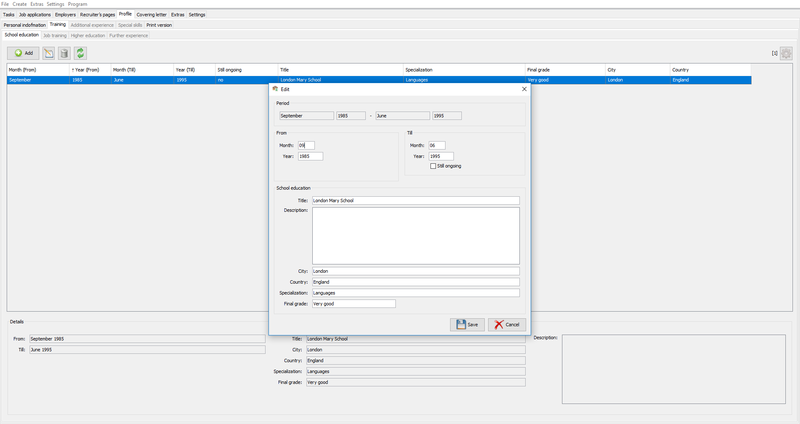 Certain parameters are available for templates that can be customized just specifying the parameter value between # symbols. In this case, it is enough to add the necessary parameter values and the letter will be generated. The profile and cover letter can be printed out or saved in PDF format for further use. The program has full statistics on the job applications and various criteria. 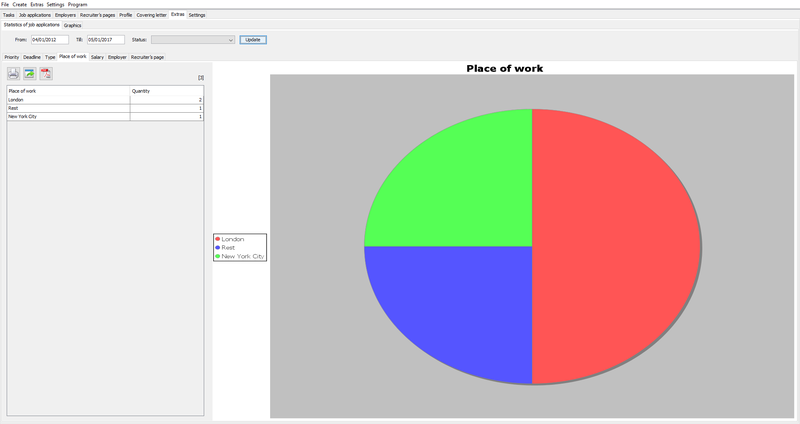 All the tables are configured in the program by the user. The data can be printed out, saved in PDF format and exported in CSV format.